Camden Road. © David Secombe 1987. Whole areas can in their turn seem woeful or haunted. Arthur Machen had a strange fascination with the streets north of Gray’s Inn Road – Frederick Street, Percy Street, Lloyd Baker Square – and those in which Camden Town melts into Holloway. They are not grand or imposing; nor are they squalid or desolate. Instead they seem to contain the grey soul of London, that slightly smoky and dingy quality which has hovered over the city for many hundreds of years. He observed ‘those worn and hallowed doorsteps’, even more worn and hallowed now, and ‘I see them signed with tears and desires, agony and lamentations’. London has always been the abode of strange and solitary people who close their doors upon their own secrets in the middle of the populous city; it has always been the home of ‘lodgings’, where the shabby and the transient can find a small room with a stained table and a narrow bed. In the midst of our jingoistic Olympic summer, I thought it might refreshing to explore the aspect of London so eloquently evoked by Peter Ackroyd in the passage above. A city of silent yet inhabited houses, anonymous windswept streets, overgrown front lawns, strange objects on the back seats of abandoned cars, forbidding municipal playgrounds, etc. (This is essentially the same territory explored by Geoffrey Fletcher in The London Nobody Knows, and as the last series on The London Column was a revisiting of Fletcher’s book, this one may be seen as a continuation of the same theme.) 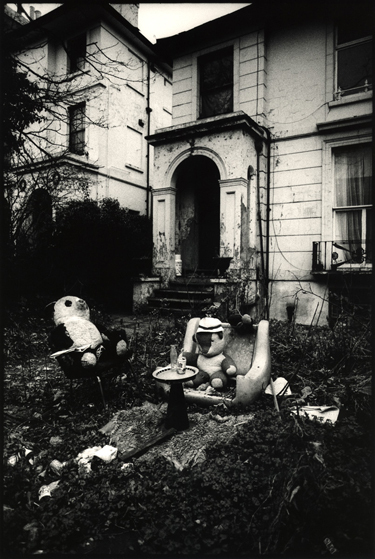 ‘London Gothic’ is becoming increasingly rare; most of the streets that Arthur Machen thought of as woeful are now exemplars of prosperous gentrification. London is a cleaner, neater place: even King’s Cross is a landscaped zone now. The photo above was taken a quarter of a century ago, and Holloway has come up in the world since then. The specific, shabby London charm that Machen and Ackroyd describe may still be found, but one has to look harder. As a small boy visiting the city from the suburbs, I was amazed by the soft enveloping greyness which made the occasional bursts of colour all the more striking. That quiet visual texture is vanishing, when even municipal housing wears screaming day-glo colours, as 1960s & 70s blocks are clad in blue, yellow, or turquoise panels. London wears its dread in brighter shades these days.